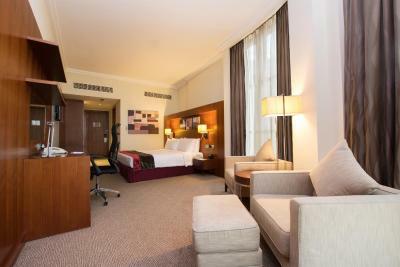 Lock in a great price for Holiday Inn Abu Dhabi – rated 8.7 by recent guests! The great hospitality of the Duty Manager Mr. Moeen. Everything I like start from reception,receptionist, room, food, entrance view. Everything is perfect. The bed is not good since it is only from two bed and it was join. At the middle you will go down. The room is cozy and quite.Staffs are very friendly and apologetic.The breakfast is splendid.The place is clean.The pool is also relaxing. Clean Place, well furnished lobby. Bed was comfy and silent AC system. 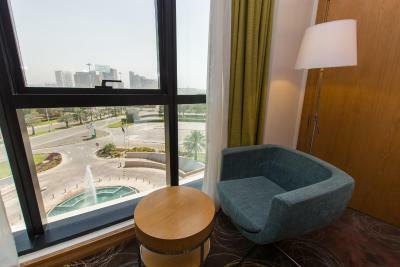 Free valet parking and spacious parking lots, location is bit far from the city center but closer to airport. 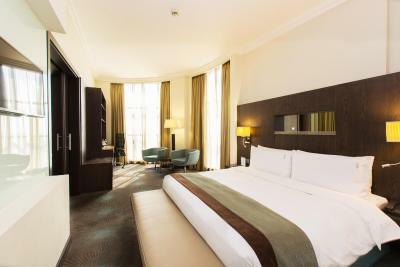 Friendly and courteous staffs in reception, house keeping and room service was quicker. Extra robes and slippers were provided on request. Payment options were hustle free and the security deposit was refunded with out any glitch. The hotel porters and valet parking attendants are very friendly and accommodating. The hotel itself is very neat. Staff was welcoming. Valet parking was prompt. Room size is good. Bathroom was clean. Breakfast options are good. Housekeeping was efficient. Room is comfortable and spacious, more than enough shelves to store belongings. The bed is also very good. 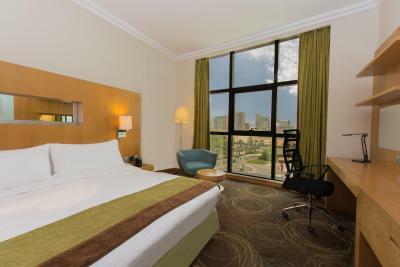 Holiday Inn Abu Dhabi This rating is a reflection of how the property compares to the industry standard when it comes to price, facilities and services available. It's based on a self-evaluation by the property. Use this rating to help choose your stay! 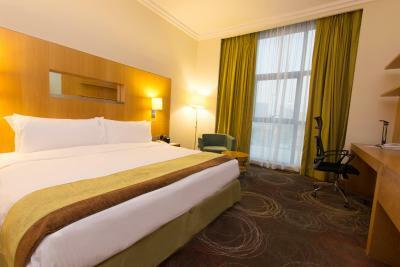 When would you like to stay at Holiday Inn Abu Dhabi? 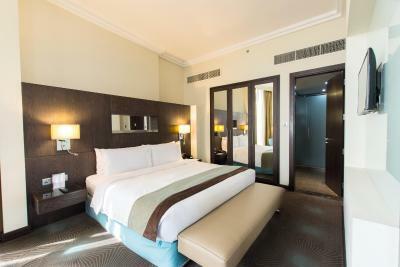 30 sqm room with high speed internet, LED TV with satellite channels, tea coffee making facility, mini bar, business table, kettle, iron board, safety box, direct access to guest floors from security controlled parking and interconnecting rooms are available subject to availability. 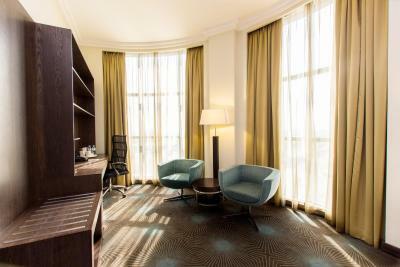 30 sqm city view room with high speed internet,LED TV with Satellite channels,tea coffee making facility,mini bar,business table,kettle,iron board,safety box,direct access to guest floors from security controlled parking and Interconnecting rooms are available subject to availability. 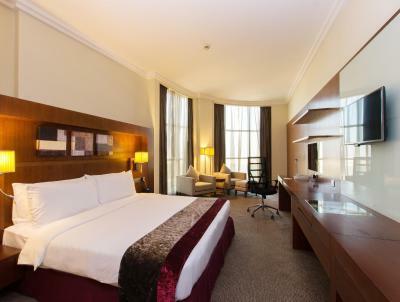 30 sqm room with high speed internet,LED TV with satellite channels,tea coffee making facility,mini bar,business table,kettle,iron board,Safety box, direct access to guest floors from security controlled parking and Interconnecting rooms are available subject to availability. 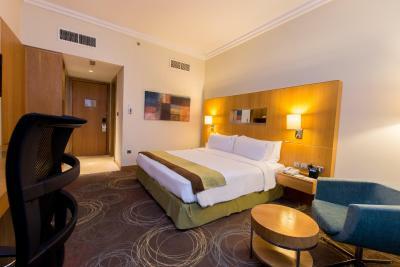 40 sqm corner room away from elevator with city view,LED TV with satellite channels,2 sofa chairs,room facility include capsule coffee machine, high speed internet,drink voucher,business center services and complementary late checkout will be subject to availability. This twin room has a flat-screen TV, mini-bar and air conditioning. 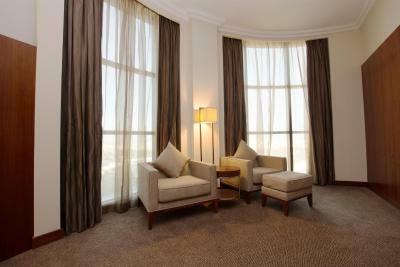 House Rules Holiday Inn Abu Dhabi takes special requests – add in the next step! Holiday Inn Abu Dhabi accepts these cards and reserves the right to temporarily hold an amount prior to arrival. Meal is good and location is convenice. Breakfast was fantastic and staff were extremely courteous & professional.